This is a very popular dish from Andalusia, very tasty and very easy to make. About the meaning of its name, some people say it is call like this because of the different colors it has or because when you taste it you just say, Olé! Whatever the reason is, this great dish is delicious to cook and share with family and friends. Have a nice meal! * Wash and peel the potatoes and dice finely. Boil in ample salted water for 15 minutes, drain and set aside. * Warm the Homemade Tomato Sauce in a pan. 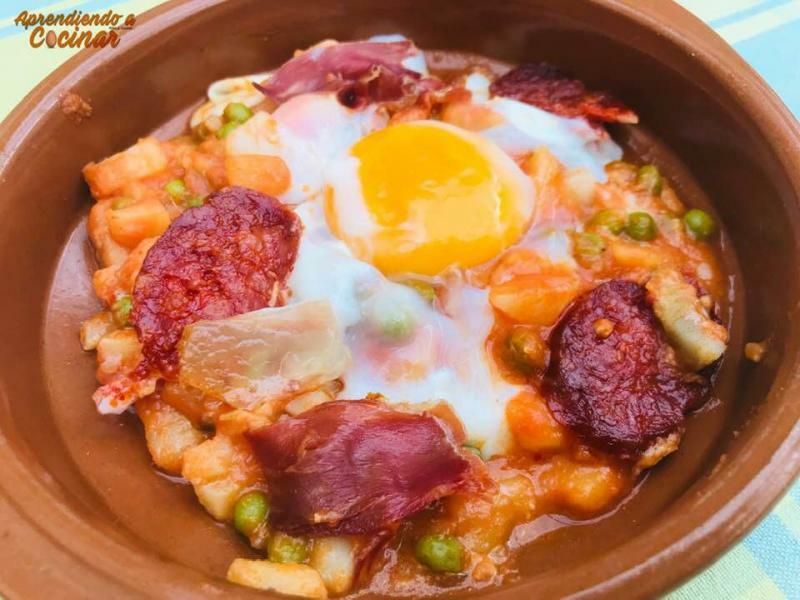 * In a Terracotta or Ceramic Cazuela Dish, add the boiled potatoes, the peas, the diced ham (Jamón Serrano), the diced Spanish Chorizo Sausage and the diced Sweet Red Peppers. * Add the homemade tomato sauce and carefully mix completely among the other ingredients to fully distribute the flavor. * Then, break the 4 eggs on top of the mixture, one per person. Sprinkle the garnish ham (jamón), sausage (chorizo) and sweet red peppers on top and place into a preheated oven at 355 degrees F (180 degrees C). * You’ll know it’s done when the eggs are cooked soft, medium or well done as you prefer. Some of you may like the eggs more well done, some softer or less well done, in order to dip some nice crusty bread into the yolk.